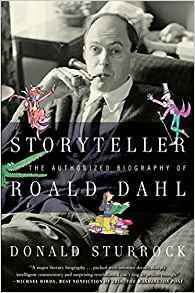 Storyteller: the authorized Biography of Roald Dahl by Donald Stubrock. Only a special author can enter the imaginative realm of a child to write a Charlie and the Chocolate Factory. Yet this authorized biography, written by someone who knew Dahl and worked with the cooperation of the author's adult children and both wives--one of whom was film star Patricia Neal--covers the man and his reputation thoroughly while veering from deeper psychological readings of his work. This is not to say the book is superficial. Neal observed that her husband was a modern Pied Piper to children, and an element of the conjurer runs insightfully through this solid biography. Dahl considered himself a wanderer between his native Norway, the U.K., New York, and Hollywood, and a depressed one at that. He was drawn to the high life and celebrities such as Chaplin, Dorothy Lamour, and Robert Altman, and to expensive artwork and furnishings. Well covered are Dahl's English boarding-school years, his flying for the RAF during WWII; prickly relations with agents, editors, and publishers; the tragic lives of two of his children; and his up-and-down marriage to Neal. Yet because this biography is authorized, one comes away feeling that there is more to tell. 16 pages of b&w photos. In the early part of the book, once his early childhood was covered, came a bit of English History with Roald's time spent in the RAF. It seems that time would change a big part of his life. Once he crash landed his airplane he would have back surgeries the rest of his life. I read this book because for a long time I did not like Roald Dahl. I couldn't figure how a man could be married to Patricia Neal for so long, have 5 children with her, help her through a devastating stroke and then fall in love with someone else! I'm still not sure I understand. But I did get a bit more information about "both sides" of the story. They were a couple with TWO egos on the line. Patricia's for acting and Roald's for writing. There's no denying that that clashed in the marriage. But Roald never once stopped writing. It did take some time of his writing short stories and articles and scripts for movies before he finally drifted into writing children's books. But once he did there was no turning back. I found the book much more interesting than I expected. I'm not really sure "what" I expected, except hopefully to not dislike Mr. Dahl as much as I did. There were pages I felt sorry for him. There were pages I wanted to slap him across the face. And there was always the hidden ego. In the end Roald would describe himself as someone with 2 steel hips, no calf muscle and 6 spinal operations to his credit. But he never felt sorry for himself. Instead.. he lobbied for knighthood, which was something he never did get. In conclusion this was a very good book and I want to thank Kelly for making it possible for me to get the book to read!! Thanks again Kelly!! Right now it's bargain price on Amazon for anyone who thinks they might like to read it!! 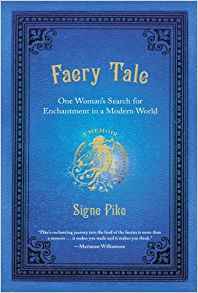 In search of something to believe in once more, Signe Pike left behind a career in Manhattan to undertake a magical journey-literally. 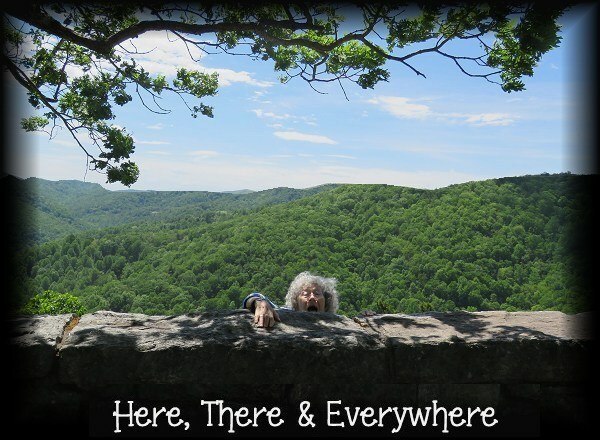 In a sweeping tour through Mexico, England, Ireland, Scotland, and beyond, she takes readers to dark glens and abandoned forests, ancient sacred sites, and local pubs, seeking people who might still believe in the elusive beings we call faeries. As Pike attempts to connect with the spirit world-and reconnect with her sense of wonder and purpose-she comes to view both herself and the world around her in a profoundly new light. Captivating, full of heart, and unabashedly whimsical, Faery Tale is more than a memoir-it's the story of rekindling that spark of belief that makes even the most skeptical among us feel like a child again. This book had a slow beginning for me... but somewhere along the line I found myself thinking that this was something that many of us would like to do. Go back to a simpler time. Go back to before you found out there was no Santa Claus or Easter Bunny. When it was simple to believe in things that made you happy. Find the Faery that makes your dreams come true. "I really don't believe in faeries. But I really want to. Not just for me, but for all of us. Because we are battered by adulthood...by taxes, by loss, by laundry, by nine to five, by deceit and distrust, by the crushing desire to be thin, wealthy, successful, popular, happy in love. All the while, we are walking on a planet that is disintegrating around us. Wow.. what a great paragraph.. I think it was then that I decided I really wanted to read this book. .... Let's go find us some faeries! "Have you been out to the stone circle in Scorhill? Of course I hadn't. "If there are faeries anywhere, she smiled, You'll find them on Dartmoor." I had also thought that the stone circles were somehow connected with the Druids. But hard facts pointed out that this was an impossibility..these circles predated Druids by thousands of years. So why did I have the impression that Druids and faeries might be connected anyway? Maybe because if faeries weren't a Christian convention they had to be a Pagen one. And Druids were pagens. But then again, wasn't everyone back then who wasn't a Christian considered a Pagen? As I approached the tiny hamlet of Stiniel, the leaves from the towering oaks overhead dappled the road with patterns that danced in the sunshine. A tall hedge ran, ten feet if not taller, on both sides of me, and I couldn't help but feel as though I was walking a lordly green corridor that led all the way to the ancient "Stone Hall". At last the hedges ended and I came to a rusted fence that ran alongside a field of tall grass and wildflowers. Beyond, the cluster of cottages that made up Stineiel came into view. A two-story house had been clipped from the pages of a Grimms' fairy tale and duly pasted onto the horizon. Tall and hewn out of hefty stone, a thatched-straw roof arched across it from which two chubby stone chimneys protruded. Just gazing at it made me hopeful. Who knew places like this could really exist? Their clothes were simple, ordinary... but there was something about the way they looked that made them seem somehow timeless. Maybe it was Wendy's long, wavy red hair, or Brian's mustache, glasses, and rosy cheeks. But something told me I had stumbled into Faery land. A rather complicated woman once asked me, "what are we here for, if not to live our own fairytales?" Sitting at the table with Brian and Wendy Froud, I knew I'd been led to exactly the right place. Eventually we were completely enclosed by the sheer rock walls, and the boulders and split fissures in the rocks were easy homes for elves and dwarves. I felt like we could be ambushed by Orcs at any moment. I hoped Orlando Bloom would step out to save me. I definitely want to be on that mountain when Orlando Bloom comes bounding out!!! So here we are.. I finished the book and now want a Faery home and I want more than ever to go to England! Not only do I want to see Cath and Merlin's cave but now I want to see some Faery's! Or at least where they once existed. We Seven by the Astronauts Themselves. Names that will be written in the History books about our beginning ventures into Space. The pioneer astronauts who took America into space tell their personal stories about the challenges they faced -- their fears, joys, friendships, and successes. Chosen from hundreds of crackerjack pilots for their fitness, intelligence, and courage, the original Mercury Seven astronauts risked their lives to cross the space frontier. In We Seven, they take readers behind the scenes to show them their training, technology, and teamwork, and to share personal stories, including the lighter moments of their mission. They bring readers inside the Mercury program -- even into the space capsules themselves. We Seven straps you in with the astronauts and rockets you along for the ride. Share Alan Shepard's exhilaration as he breaks through the earth's atmosphere. Endure moments of panic with Gus Grissom when his hatch blows, stranding him in the open sea. Race with John Glenn as he makes split-second life-or-death maneuvers during reentry, and feel his relief when he emerges safe but drenched with sweat. Despite such heroism, Project Mercury was more than the story of individual missions. It defined the manned space flight program to come, from Gemini through Apollo. 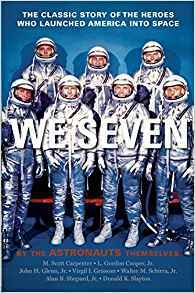 In We Seven, America's original astronauts tell us firsthand -- as only they can -- about the space program they pioneered, and share with us the hopes and dreams of the U.S. at the dawn of a new era. Most who know me know that I love our Space Program and most especially the Mercury , Gemini, and Apollo flights. In the beginning: there were 7 Astronauts. Not that I haven't read other books about our Space Race to the Moon, but I purchased this book because it was to be the individuals talking about their first missions. I have to admit that parts of it was a bit techy for the likes of me, but as soon as they began speaking of their individual flights I knew I'd enjoy the book.. and I did. The Amazon review is a good one and it covers the books pretty well. So I thought I would give you some passages from the book..because no matter how many books I read on the beginning of our Space Missions, I always learn a little more. "The engineers worked out three different ways of firing the small retro-rockets which would start us back towards the earth when it was time to come home. These were wired so they could be activated either by the automatic timer on the instrument panel, by the Astronaut himself, if the timer failed, or by command sent up by radio from control stations on the ground if the other two methods failed"
Who knew just how many backups they had in place to be sure things worked?! "Someone estimated that we spent a good two-thirds of our time devising and testing out this system of automatic controls which would allow us to orbit a capsule without a man before we were ready to risk a pilot. It so happens that safety was always one of the most important factors in running project Mercury." "At 9:34 EST on May 5, 1961 the technicians got to the bottom of their countdown list and there was nothing left to do but push the button which ignited the Redstone. The flames roared out of the engine and licked across the pad, searing the concrete. For a second, the Redstone seemed to hesitate. Slowly and agonizingly at last, it began to climb." I not only believe Space is our final frontier... but a necessary frontier. I've read this series of books right from the beginning. 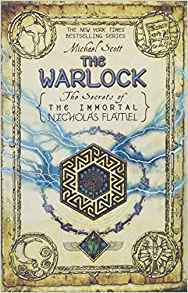 When I read the title of the first book: The Alchemyst (The Secrets of the Immortal Nicholas Flamel) my mind jumped to the first Harry Potter where I remembered hearing the name Nicholas Flamel, and I thought, "hmmmm, maybe I should check this out"... and I did... and I loved it! And I've enjoyed every single book that followed it, The Warlock not being an exception! (But it almost was!) I can't give away any Nicholas Flamel Secrets but I was not happy with page 127! (now everyone who has the book will turn to page 127 lol).. but then again I did keep reading... after all there are far too many characters for me to "sulk" over one! All the regulars were back at their old games! Dr John Dee and Virginia Dare were winning over Josh while Nicholas and Perenelle had won over Sophie. The twins were split! (enter twilight music) Mars Uthor could move again! (Ooooo now how did that happen?!) and many others were taking sides. Prometheus, Niten, Scathatch, and Shakespeare. And then there's all the monsters on Alcatraz Island waiting to be set loose on San Francisco! I read the book slowly (yeah, I know I've done that with all my books lately) but I did want to savor this one. I've waited a year for it to come out and now it's over. *pout* ... but I do have to say, book 5 had a most surprising ending..... yet still a bit of a cliff hanger wondering how it will all end!!! So.. here I wait broken hearted.. having to wait another whole year until I get to read the conclusion!! If you like ya books I do believe you will like this series!! I've come to more than like this series of books. I think Michael Scott is a very fine author indeed!... now, if he'd only stay off of twitter and finish writing the dang last book!!! 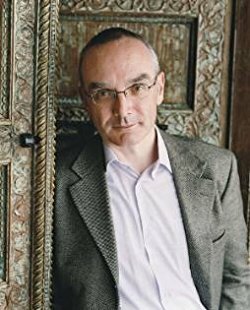 I do want to thank Michael for being not only a very fine author but also a very approachable person, who is kind enough to keep in touch with his fans. Thanks Michael!... now get to work!